AWS cost optimization is typically the third stage of a company´s “cloud awareness”. In a similar way to how data center usage first took off, companies first adopt to Amazon´s cloud compute service, next expand their use of the service, and then enter a third stage of optimization, when they attempt to control their usage to prevent AWS costs spiraling out of control. In many cases, companies turn to their developers to write scheduling scripts for optimizing AWS costs. The thought process behind this approach is that scheduling non-production instances to be switched off when they are not required will result in AWS cost optimization. The thought process is right, but the methodology is wrong. Reassigning developers to focus on non-core activities is expensive. Just because developers can write scheduling scripts for optimizing AWS costs, it does not necessarily mean that this is the most cost-effective use of their talents. Indeed, depending on the size of a company and the number of non-production instances it deploys, it could cost more to use developers’ time to optimize AWS costs than the savings that can be achieved. An alternative to reassigning developers to non-core activities is software for AWS cost optimization. Software to optimize AWS costs helps companies keep development, testing, and staging costs under control by automatically scheduling on/off times for non-production instances. It can also help with account governance and enhance security. Software for optimizing AWS costs works via a single view dashboard that allows administrators to monitor instance activity and make informed decisions about the allocation of their resources. Administrators can also create permission tiers that allow development teams to schedule on/off times for their own non-production instances without affecting the scheduling times of other teams. By scheduling instances to be switched off when not in use, software for optimizing AWS costs also enhances security. While they are switched off, the instances are inaccessible. This means that there is no risk of unauthorized access and data theft. It also saves the resources of network security personnel, who do not have to monitor switched-off resources or conduct unnecessary virus scans. Software for optimizing AWS costs automates the manual process of switching off each non-production instance via the AWS console, and then switching it back on again when the instance is required. By implementing AWS cost optimization software, companies eliminate the need for developers to write scheduling scripts and deploy them to suit each team´s requirements. In order to schedule on/off times, users log into the software with their Amazon role or user credentials. The software discovers the instances assigned to that user and identifies which are suitable for scheduling based on their names and tags. The user can select some or all of the suitable instances and choose to assign a pre-configured schedule or create one of their own. Schedules are created using an intuitive grid indicating days of the week and times of the day. Users highlight the days and times they want their selected non-production instances switched off and click “schedule”. Once all the schedules have been set and confirmed, the UI displays the projected savings over the next thirty days. Once the schedule is in operation, the projections become actualized. How Much is Saved by Optimizing AWS Costs? Depending on how many non-production instances can be scheduled, the financial benefits of AWS cost optimization software can be significant. A typical pre-configured schedule would switch off unrequired instances between the hours of 7:00pm and 9:00am on weekdays and all day during weekends, saving companies more than 70% on the cost of deploying non-production instances. In order to increase savings further, development, testing, and staging instances can be scheduled to be switched off by default, and the schedule “snoozed” when access to the instances is required. If a company is able to commit to a one or three-year contract, savings can be maximized by deploying production instances on Amazon´s “Reserved Instances” pricing option. This particular scheduling model was chosen by our client Avid – a global audio and video technology company. Avid used our AWS cost optimization software “ParkMyCloud” to save $55,000 annually on the cost of deploying instances on Amazon´s cloud compute service. A second client – Tristar Medical Group – used a similar scheduling model to realize savings of up to 60%, which is $240,000 annually, on non-production instances deployed on AWS EC2. If your company has reached the third stage of “cloud awareness” and is struggling with AWS cost optimization, we invite you to try ParkMyCloud free for thirty days. Our offer enables companies to try our software for optimizing AWS costs in their own environment, witness the savings that can be achieved, and make an informed evaluation of our service. No credit card is required to take advantage of our offer. There are no contracts to sign or obligation to continue with our service at the end of the trial period. Simply register for your free trial with your email address, or contact us for more information about how ParkMyCloud can be a more cost-efficient solution to AWS cost optimization than have your developers focus on non-core activities. Cutting AWS costs is not the same as achieving AWS optimization. In order to optimize your costs you need total visibility of your accounts. 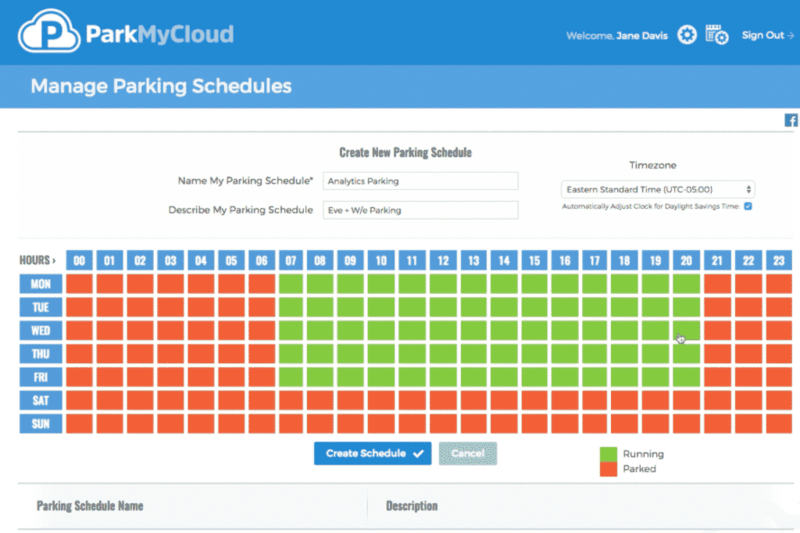 ParkMyCloud provides total visibility and the tools required to increase accountability. Our scheduling software can also help with future capacity planning and budgeting. Try ParkMyCloud today and save up to 70% of the cost of deploying non-production instances on AWS.